The products are made using the drumstick tree (moringa tree), nature's most potent plant, to help people live healthier and happier lives. 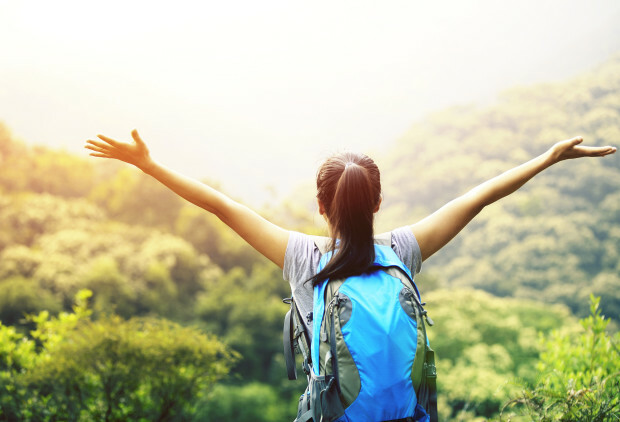 LOS ANGELES, Feb. 4, 2019 /PRNewswire/ -- All Moringa has launched a new natural luxury brand of health and wellness products. The internal supplements and therapeutic skin care are made using the Moringa tree and are 100 percent pure with no synthetic ingredients added. The company never compromises on quality, from seeds to the plant-based extracts. Found in the native southern foothills of the Himalayas, the Moringa Oleifera is a fast-growing variety of tree. All Moringa is partnered with a 100 percent organic and self-sustaining Moringa farm in southern India and manages all U.S.-based imports and distribution. 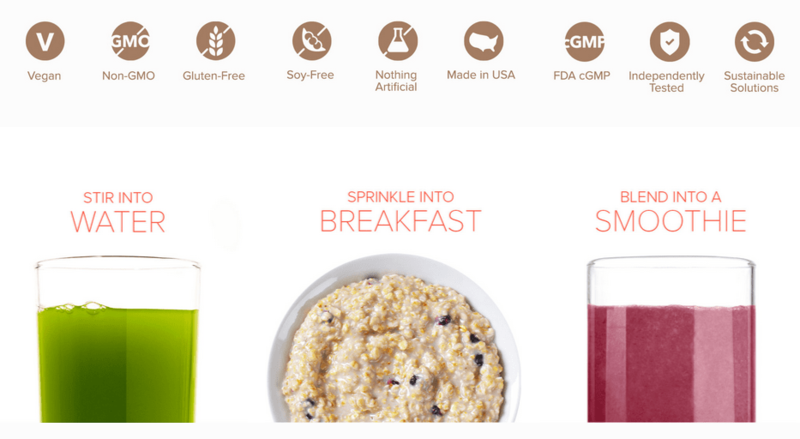 "We are excited to launch this new natural luxury brand into the marketplace," says Tzvi Ginzburg, CEO of All Moringa. "For centuries, natives have used the Moringa leaves and pods as a valuable food source, and Ayurvedic medicine credits its preventative and medicinal treatment capabilities for many diseases. 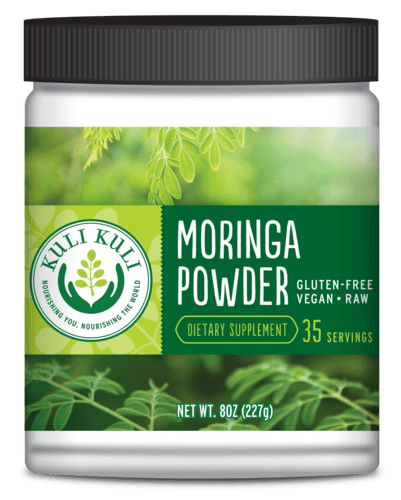 All Moringa was launched from a personal health journey that turned into a desire to share the benefits of the Moringa tree with the global community." Experts have noted that the leaves, bark, flowers, fruit, seeds and root of the Moringa tree are all beneficial. On its website, All Moringa has provided 51 moringa tree benefits for diet, beauty, health and wellness. The company currently offers several products including: Organic Moringa Oil for skin, body, face and hair; the Organic Moringa Mint Tea, Organic Moringa Ginger Tea, and Organic Moringa Capsules all for consumption; and the Therapeutic Organic Moringa Moisturizing Body & Face Cream and Therapeutic Organic Moringa Butter both for the skin. To learn more about the company and their Moringa tree products and benefits, visit AllMoringaTree.com. All Moringa supports beauty, health, and well-being by producing superlative quality Moringa plant natural extractions for internal herbal supplements and therapeutic skin care products. For more information, visit AllMoringaTree.com. The company can also be found on Instagram. This entry was posted in News, Newsletter, Personal Care, Product Review, Skin Care and tagged 2019, all moringa, moringa, personal care, skin care on February 7, 2019 by Frank. CLUO, the first ready-to-drink range to harness the powerful health and beauty benefits of the superfood, Moringa. mould, straddling cosmetic and drinks markets in both packaging, design, ingredients and claims leading the charge in the predicted massive growth ‘nutricosmetics’ market. CLUO is a 98% Moringa leaf infusion delivering all the Moringa goodness from the leaves which are the most nutritious part of the Miracle Tree. Jarrett Health Ltd is a family UK based company and we operate with very strong values that include honesty, integrity and fairness. We are also strong believers that money is created for a reason and should be given a purpose. This is why 10% of all the profits raised with go to The Jarrett Foundation, an international children's charity to help to educate children in the developing world. 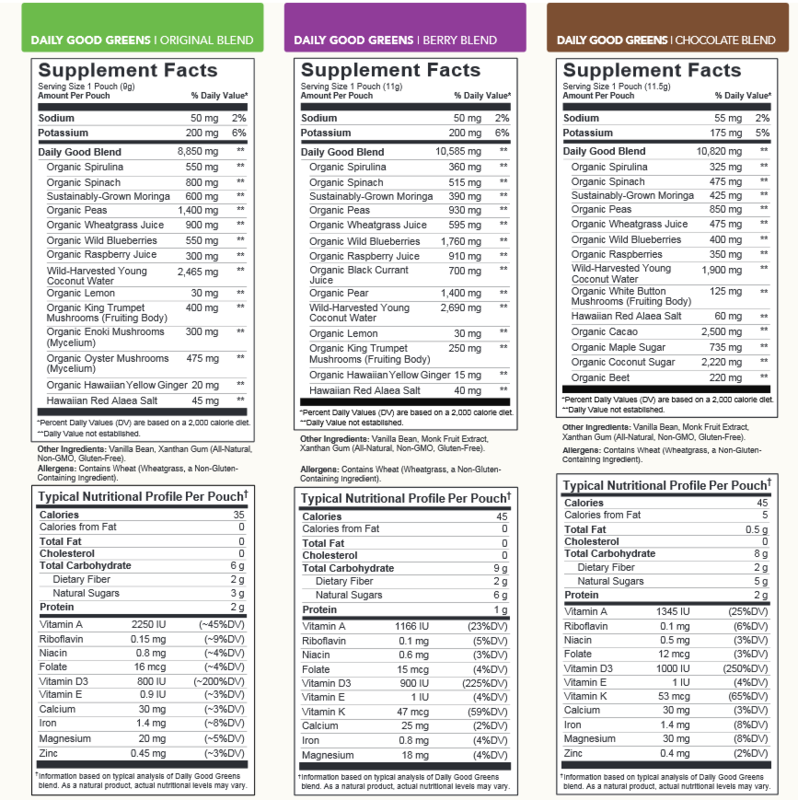 Claims: Harnesses the benefits of Moringa, contains 98% Moringa leaf infusion. This entry was posted in Beverage, Drink Trends, News, Newsletter, Product Review, Supplement and tagged beauty drink, beverage, CLUO, moringa, supplement, uk on January 21, 2016 by Staff Editor. An energizing, tasty green shot that helps to plant moringa trees and empower farmers in Haiti. Back us now to make it happen! Moringa is the most nutritious plant on the planet. Moringa leaves are more nutritious than kale and provide a complete protein, similar to meat or quinoa. 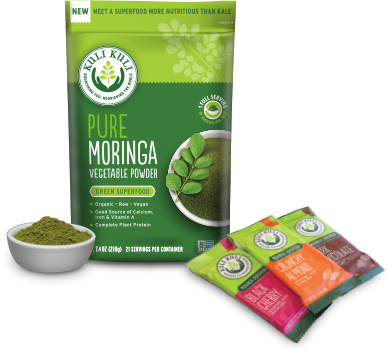 Kuli Kuli was founded by a former Peace Corps Volunteer to use moringa as a tool to improve nutrition worldwide. Through our last Indiegogo campaign, we launched our Moringa Superfood Bars into over 500 stores across the US, planting 60,000 moringa trees and providing a sustainable livelihood to 500 women farmers in Ghana. Now we want to do it again, launching a Moringa Green Energy Shot that will revitalize you while revitalizing Haiti. 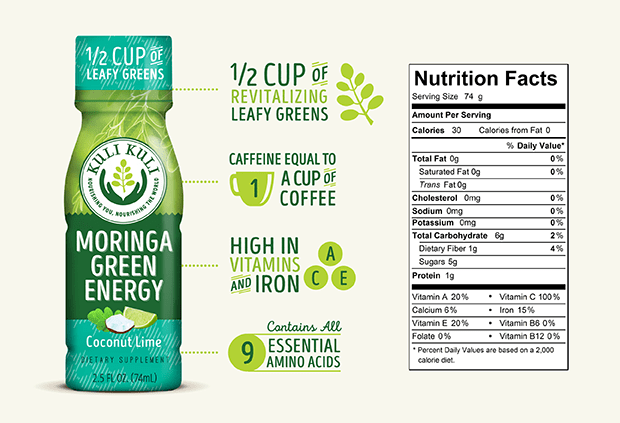 What's a Moringa Green Energy Shot? 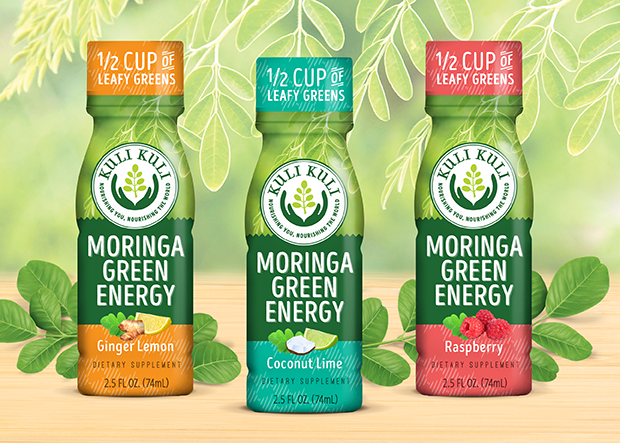 Kuli Kuli’s Moringa Green Energy Shots combine vitamin-rich Haitian moringa with green tea and natural fruit flavors to provide a powerful green energy boost. Each shot is equal to a cup of coffee and half a cup of leafy greens to power you through your day. Try it as part of a healthy breakfast, before a long run, or as an afternoon pick-me-up. Every revitalizing shot you take helps to plant moringa trees and support farmers in Haiti. Nourishing you, nourishing the world! Lisa Curtis witnessed the challenges that rural communities in West Africa face as a Peace Corps Volunteer in Niger. After a few months with limited fruits and vegetables, she found herself experiencing early signs of malnutrition — a condition that affects over 18 million children across West Africa. Then a friend told Lisa about moringa, a local tree with highly nutritious leaves and handed her a bag of kuli-kuli, a Hausa food made from peanuts, to make a delicious, nutty moringa dinner. Lisa incorporated moringa into her diet and began to regain her strength. Lisa saw a solution to the malnutrition and poverty in her village growing in the nutritious leaves of the Moringa oleifera tree. Upon returning to the U.S., Lisa worked with her childhood best friend, Valerie Popelka to create the first prototypes of what became Kuli Kuli Bars. Jordan Moncharmont and Anne Tsuei brought their web and design skills to the team, and together we formed Kuli Kuli, a mission-driven business. Claims: Rich in iron and vitamin A, suitable for vegetarians and vegans. This entry was posted in Beverage, Drink Trends, Energy, News, Newsletter, Product Review and tagged energy shot, kuli kuli, moringa, Superfood on September 22, 2015 by Frank. The perfect addition to smoothies, meals & snacks. Kuli Kuli sells delicious food products made with moringa oleifera, a powerful superfood sustainably sourced from West Africa. Start your day off right with a smoothie made with our fresh Moringa Powder and keep the energy going with a midday snack on our Kuli Kuli Bars. Moringa is one of the most nutritious plants in the world. Kuli Kuli works with women-owned farming cooperatives in West Africa who grow moringa and use it to nourish themselves and their communities. A Peace Corps Volunteer had a dream to use the nutritious leaves of the moringa tree to improve the lives of women in West Africa. Out of that dream, Kuli Kuli was born. This entry was posted in Company Spotlight, Food Trends, News, Newsletter, Product Review, Videos and tagged kuli kuli, moringa, Superfood, West Africa on June 29, 2015 by Staff. Moringa is a one-stop shop for fulfilling your body’s nutritional needs. As the only plant that contains a complete protein, iron, calcium and vitamins, this super-leaf is the perfect way to get the nutrients you need to thrive. 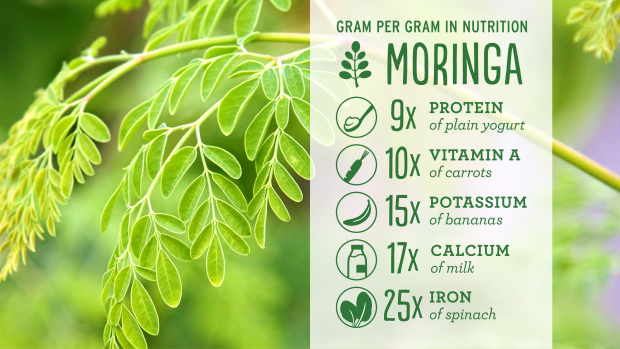 Now you can incorporate the benefits of moringa into your smoothies, meals, and snacks. 100% Dried Moringa Leaf Powder Grown and processed in Ghana. Packed in the U.S.A. This entry was posted in Food Trends, News, Newsletter, Supplements and tagged africa, kuli kuli, moringa, supplement on November 13, 2014 by Frank. Why are the most nutrient-dense foods also the hardest to get? Moringa, spirulina, wild blueberries from Alaska? It can be exhausting, not to mention costly, trying to get high quality superfoods that your body needs daily. We make it easy and simple to get what you need (and more), all in one convenient pouch. • No artificial flavors, sweeteners, chemicals, or fillers. Ever. In the Hawaiian language, aloha means “sharing the breath of life.” At ALOHA, we aim to do this by making health simple, fun, and accessible. Maintaining a healthy lifestyle has become needlessly complicated. False claims, conflicting messages in the media, and weak regulations in the wellness industry are constant sources of confusion. We are increasingly exposed to stress and environmental toxins that compromise our health. ALOHA works to address these challenges and make an impact. 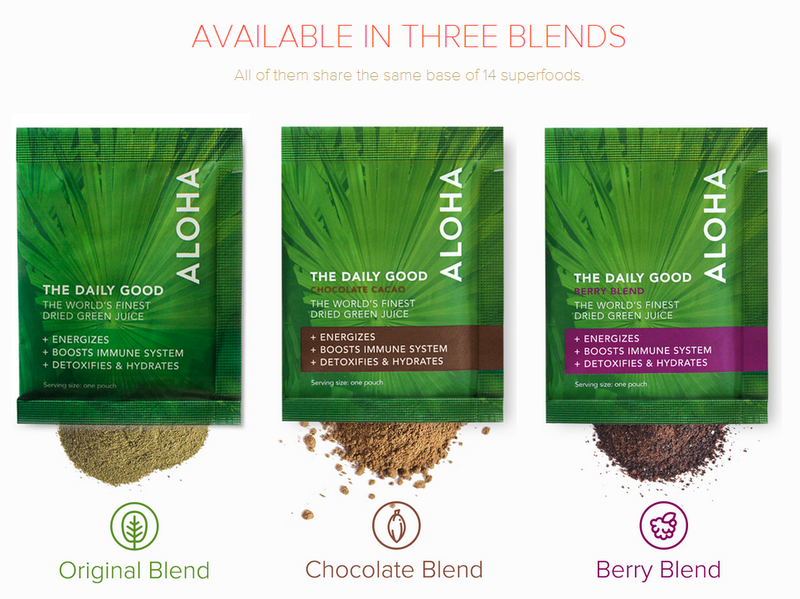 This entry was posted in Food Trends, News, Newsletter, Product Review, Supplements, Videos and tagged aloha, daily good greens, dietary supplement, moringa, nutrient dense, Superfood, supplement on October 12, 2014 by Frank. Kuli Kuli bars are a delicious blend of simple, wholesome ingredients and moringa, a powerful superfood sustainably sourced from women’s cooperatives in West Africa. Tart cherries and sun-ripened dates mingle with moringa to produce a vibrant cherry bar that is sure to keep you coming back for more. Cherries, Almonds, Dates, Agave, Moringa, Organic. Contains Almonds. This entry was posted in Food Trends, News, Newsletter, Product Review and tagged bar, black cherry, kuli kuli, moringa on November 27, 2013 by Frank. 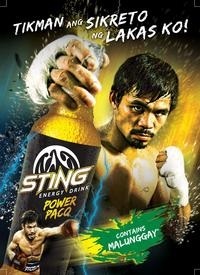 PepsiCo Philippines recently launched its latest product in the energy drinks segment -- Sting Power Pacq. The drink brings together functional advantages of the Moringa plant (“Malungay” in Filipino) with endorsement from Manny Pacquiao, the world-class, eight-division champion Filipino boxer. The product, unique to the Philippine market, was developed through a collaborative effort among PepsiCo Marketing, R&D and Operations. The product was launched on March 25 across different networks, featuring Manny in a mock press conference where he revealed that Malungay helps him feel faster, stronger and braver. "Sting Power Pacq epitomizes the functional differentiation and breakthrough communication which has driven PepsiCo’s portfolio transformation," said Sunil D’Souza, country manager, PepsiCo Philippines. "In partnership with Pepsi-Cola Products Philippines Inc. (PCPPI), the Philippines team has raised the bar yet again. With PCPPI investing strongly behind the brand, PepsiCo Philippines plans to quickly change its trajectory in the energy segment." Carbonated water, Sugar, Citric Acid, Artificial flavour, Maltrodextrin, Sodium Citrate, Sodium Hexametaphosphate, Taurine, Potassium Sorbate, Caffeine, Sodium Benzoate, Tartrazine, Inosital, Calcium Disodium EDTA, Modified Food Starch, Panax Ginseng Extract, Niacinamide, Sunset Yellow, Pyridoxine Hydrochloride, Moringa and Cyanocobalamin. This entry was posted in Beverage, Drink Trends, News, Product Review and tagged moringa, pepsico, philippines, soda on August 12, 2013 by Frank. There are millions of health-conscious people looking for natural ways to nourish their busy lifestyles, just as there are a billion people seeking nourishment to survive. We’re connecting these two groups through moringa. Moringa is a powerful tool in the fight against malnutrition because it requires little water and flourishes in harsh climates. We’re working with women’s cooperatives in West Africa to grow more moringa for their communities and create economic opportunity. We’re bringing this West African grown moringa to the United States in the form of delicious, raw* and gluten-free Kuli Kuli Bars. * Honey Almond and Black Cherry are completely raw. Dark Chocolate Cherry is 90% raw, since the chocolate chips have been cooked. Filled with simple, nutritious ingredients and a uniquely refreshing moringa flavor, Kuli Kuli Bars contain just the right amounts of fiber, protein, iron, and vitamins to help you power through the day. If you’re tired of eating energy bars that are too sweet, too dry, and full of unpronounceable ingredients, help us do our first manufacturing run by backing our campaign today. The good news is, we can do this pretty economically. But we need your support to make Kuli Kuli bars available to the world. Most importantly, we need to raise funds for our first production run. That means $32,300 to do our first manufacturing run, including ingredients, packaging and labels. In addition, we need at least $5,000 to cover grocery store fees and sampling costs; $3,500 in legal fees and insurance; $3,200 for distribution and storage; $1,000 to build our online marketplace; and $5,000 to further develop out our supply chain in West Africa. All together, that’s $50,000 which is why we need your help. Kuli Kuli contains just a few simple, all natural ingredients plus moringa to provide a powerful burst of nutrition and energy. High in fiber, protein, vitamins and antioxidants but low in calories, Kuli Kuli bars are perfect for breakfast or as a pre-workout snack. After working with moringa in the Peace Corps to reduce malnutrition in Niger, our CEO Lisa wanted to continue to support women in West Africa to grow more moringa and utilize it to improve the health of their families and communities. Many of the women we work with are earning up to $300 per month -- that’s a lot of money in West Africa! The idea sounded pretty intriguing to Valerie, Jordan, Anne, and Nadia. For the past two years we’ve been doing research -- both in the kitchen and in the field, trying to figure out a way to make an impact on global nutrition through moringa. But the thing is, we can’t keep up with the demand. It takes three of us six hours to make 200 bars -- the same amount of bars that a factory could make in less than 2 minutes. So we need your help to produce our first manufacturing run of these bars and bring them to the world. This Indiegogo project is only the beginning of what we intend to create: our goal is to build a series of moringa products and a network of moringa cooperatives improving nutrition in communities around the world. Help us get our first product off the ground and we will seed the movement to a healthier world. This entry was posted in News, Product Review and tagged bar, crowdfunding, kuli kuli, moringa, snack, Superfood on May 10, 2013 by Frank. The all-new Jugular Energy Drink will contain Moringa Oleifera, a natural ingredient that lends nutritional, therapeutic, and prophylactic qualities. Ounce for ounce Moringa Oleifera is said to contain more Vitamin A than carrots, more calcium than milk, more Vitamin C than orange juice, and more potassium than bananas. The protein in Moringa Oleifera rivals that of milk and eggs. The Moringa species is rich in compounds containing simple sugar, rhamnose, and it is rich in a unique group of compounds called glucosinolates and isothiocyanates. Components of Moringa preparations are reported to have hypo-tenisve, anticancer, and antibacterial activity. This entry was posted in Beverage, Drink Trends, News, Product Review and tagged all natural, beverage, drinks, energy, energy drink, ingredients, jugular, moringa, Moringa Oleifera, natural, product review on January 8, 2013 by Frank.